The event which is assumed to be a marked calendar Programme for most Ghanaians since its inception is evidently a big one for all Africans in the diaspora with patronage from some white folks who enjoy Ghanaian tunes. 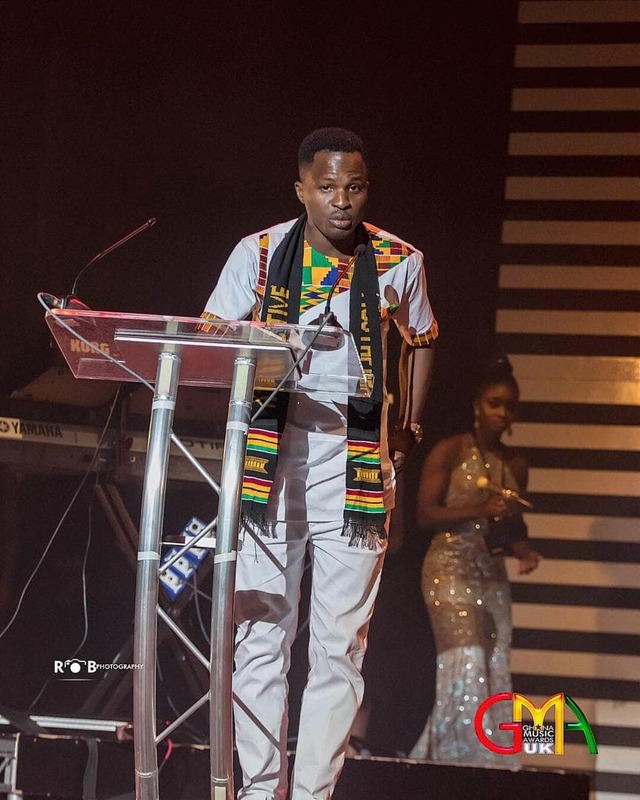 The 2018 edition of the Ghana Music Awards UK which took place at the Gaumont Palace – Dominion Centre in London on 6th October was a huge success and as usual ignited the Ghanaian aura in the audience. Performances from one of Ghana’s fast rising musician King Promise, the lyrical Pono Biom, Captain Planet, sensational Wutah Afriyie, controversial hip-life artiste Patapaa, International Fisherman Gasmila, Fancy Gadam and a tall list of acts on stage lit up the programme from beginning to the end making it extraordinarily ecstatic. Even though there were numerous occurrences that contributed to the eventual success of the programme which I ‘Attractive Mustapha NII Okai Inusah’ think Ghanaian event organizers must take a cue from, there were also a few bad incidents that characterized the event. I was impressed by the attendance. Judging from the numbers that showed up for the event, one can confidently say that the organizers were very strategic with their promotion methodology. Maximum security was provided by the organizers which saved many situations that could have otherwise turned chaotic. The security guards exhibited commendable tactfulness in executing their task. The organizers also treated the crew from Ghana excellently with utmost respect and attended to every beck and call with a sense of urgency. One other thing that is worth noting is the fact that plaques that were given to winners of the various categories were for keeps, unlike an unpopular practice by other award schemes whereby one plaque is displayed by all awardees. Despite the indisputable fact that the event was generally successful as anticipated, there were a few instances that nearly marred the beauty and enthusiasm generated at the atmosphere. First and foremost, as usual with Ghanaian events, the main programme started with an apology at 10:00PM instead of 7:00PM, three clear hours late from the schedule. Can one assert that it is the usual Ghanaian way of doing things that has been replicated by our people in the UK? To add insult to injury, the Emcees Black Boy who did his best and confidence Haugen further dragged the show with unnecessary jokes coupled with unamusing talks and had to do away with the script designed to regulate the smooth running of show. The lowest point of the event was carried by our own stunning and forever young Stephanie Benson, who unimaginably mentioned an artiste who was not even nominated for the “Best UK based Afrobeats Artiste of the Year Category ” as the winner to the shock of the organizers who had to quickly appear on stage to announce the right winner. As if that was not enough, Afia Schwarzenegger created a whole mess when she turned every opportunity she had into casting insinuations and portraying a verbally assaulting character as if she had specific targets. This infuriated someone among the audience who attempted to beat her whilst she was on stage but for the swift intervention of the security forces guarding the event. Then at a time when the response and excitement had increased to a higher degree, the Swedru champion Patapaa Amisty decided to pause all the hailing and dancing in the auditorium to pick monies thrown at him whilst extending a warning to his choreographers not to pocket any notes. In all these, a huge number of people had gathered outside the auditorium which was full to capacity begging for free tickets to enter. In its entirety, I think the organizers did extremely well with the coordination and deserve some accolades because it was obvious that the expectations of the audience were met by close of the event based on their comments. I am very optimistic that Ghana Music Awards UK will continuously be the biggest Ghanaian event in the United Kingdom for years to come and I further urge the organizers to improve on the little mishaps. If you are a Ghanaian living in the UK, this is an event you cannot afford to miss because it brings the indigenous Ghanaian entertainment taste close to you.